BISMARCK, N.D. (AP) -- North Dakota confirmed Thursday the discovery of a new radioactive dump of waste from oil drilling, and separately a company hired to clean up waste found in February at another location said it removed double the amount of radioactive material originally estimated to be there. 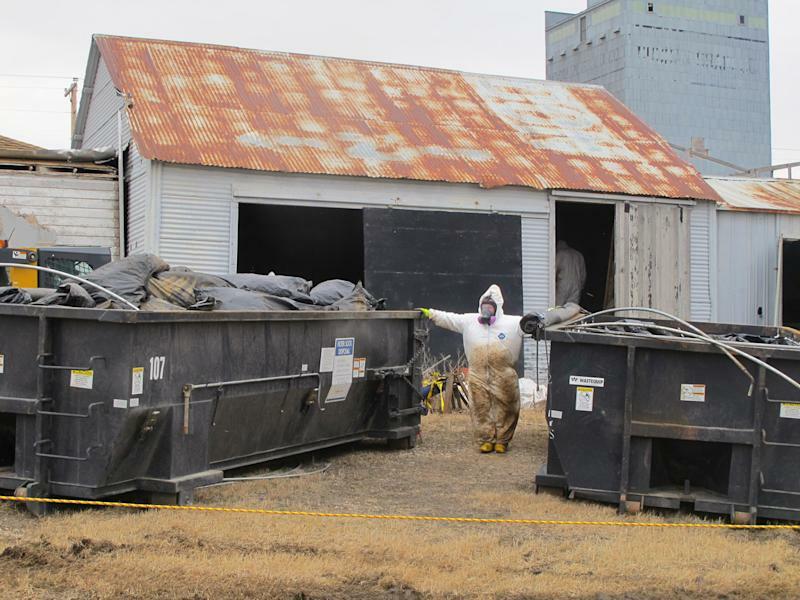 The Canadian company hired to clean up the largest dump found so far, located at an abandoned gas station in Noonan, also said that it suspects the soil at the site is contaminated and that samples were being analyzed. The twin disclosures highlight a growing problem from North Dakota's booming oil development — illegal disposal of oil filter socks, which are tubular nets that strain liquids during the oil production process and contain low amounts of radioactive material. Health officials have said that radioactive filter socks increasingly are being found along roadsides, in abandoned buildings or in commercial trash bins — sometimes those of competing oil companies. State Environmental Health Chief Dave Glatt said investigators are examining the new site north of Crosby — a town about five miles from the Canadian border — which was discovered late last week by Divide County Emergency Manager Jody Gunlock. Gunlock said he found 15 garbage cans and about 25 bags full of the oil filter socks. "So maybe one-fourth of what we found down in Noonan," Gunlock said, "But you know, it's still a significant amount and it's still an environmental problem." Glatt said the former landowner is in prison on an unrelated charge and that the new owner is cooperating with officials. They believe the waste was dumped before the land was sold, but has been covered up by snow for months. Gunlock, who grew up in Divide County and moved back in 2012 after serving in the military for 30 years, said the oil boom has changed his once quiet hometown for better and worse. The population has increased and businesses are faring better than they have in the past, but roads are getting torn up and these new environmental problems increased drastically this winter, he said. "Between brine being dumped on the roads, human waste being dumped in farm yards, and now these radioactive socks — oh my gosh, it's out of control." Brine or saltwater is a byproduct of oil production and the sewage is because so-called "man camps" where some oil workers live cannot handle the amount of effluent. Oil companies are supposed to haul filter socks to approved waste facilities in other states such as Montana, Colorado and Idaho, which allow a higher level of radioactivity in their landfills. State regulators said new rules are being written to track oil field waste, in response to growing environmental concern. Crosby Mayor Les Bakken said allowing oil companies to dispose of the socks at an in-state facility would help decrease illegal dumping. "I do think if there was a disposal site closer, it would help." Confirmation of the new site came as a Calgary, Alberta-based company, Secure Energy Services, said it removed 45 cubic yards of radioactive waste Wednesday, more than double what was originally estimated, from what had been described in February as the largest dump found so far. Robert Krumberger, the company's manager of technical services who led the cleanup, said the lower level of the gas station was "completely full of filter socks." The company was transporting the waste Thursday to an out-of-state facility for disposal. Scott Radig, the director of waste manager for the state health department, said there is little danger to the public from the radioactive waste. "The only concern at those levels would be from ingestion or inhalation," he said. Krumberger said it's possible that some of the soil at the Noonan site has been contaminated. "So at this time, it is suspected, so we're waiting for final laboratory analysis to determine what remains in the soil where the filter socks were stored." The state has no plans to clean up the private land at Noonan further after the radioactive material was removed, Radig said. "It's still a dumpy site," he said. "It's not what I would call a clean site."